Reference number for this case: End-Sep-54-Perpignan. Thank you for including this reference number in any correspondence with me regarding this case. MULHOUSE. -- Two people stated to have seen a luminous machine in the sky, in Rixheim. Using binoculars, they noted that it had the shape of a long cigar. A dozen small satellite cigars surrounded it. A railway man on night duty stated to have observed the same phenomenon. BESSEGES. -- Two residents of the commune of Foussignargues, close to Bessèges, stated to have seen in a meadow, near their house, in the night from Sunday to Monday, a sharp red luminous machine surrounded by vertical stems. PAU. -- Thursday morning, around 11:45, many people saw in the sky, at a very high altitude, a mysterious machine having the shape of a long and shining balloon. The machine came from the South and moved towards the North-West. NEVERS. -- Mr. Raymond Deloire, 20 years old, farm laborer in Langeron (the Nievre), who circulated by bicycle on the road of St-Pierre-le-Moutiers, saw in the sky a mysterious object of half-spherical form emitting at the front a sharp orange gleam, flames spouted out from the back. The machine moved without noise at a great speed in direction of the North-East. PERPIGNAN. -- Mr. Jean-Bertrand Petit, residing at the Conte Farmhouse, close to Perpignan, was sprinkling his salads, around 3:30 in the morning, when he saw a ball of fire in the sky. The display was short and did not leave traces. In Thuir, Thursday, around 6:15 p.m., a machine having the shape of a haloed barrel of fire was seen by a person worthy of faith. The apparatus, which worked at a slow pace, disappeared in direction of the sea. In addition, several residents of Perpignan claim to have seen yesterday, at approximately 2 p.m., above the city, a luminous sphere, sometimes red, sometimes white and which moved during several minutes before fainting in the sky. FLEURY-D'AUDE (C.P.). -- Yesterday evening, from 9 to 10 p.m., the population of Fleury was able to see a luminous sphere, whose color changed from the red to the green, then to the white, moving slowly above the locality. The machine marked times of immobility and it was then possible to detect that it had a rotational movement. The luminous sphere then moved in direction of Béziers and disappeared. PUIVERT. -- Mr. Saboureau, lemonade seller in Bélesta (the Ariège) made the Bélesta-Puivert way in a van, when he saw in the sky, yesterday towards 5 p.m., a very brilliant ball like a sun following the North-South direction, flying at an altitude which he estimates as 2.000 meters, and moving at a relatively reduced speed. The ball moved without the least noise and was followed of a long tail of gray smoke. Mr. Saboureau having stopped his vehicle for better observing, could see, after a few minutes the machine disappear in the direction of Ax-les-Termes. His observation allows him to affirm absolutely that it was not a plane. 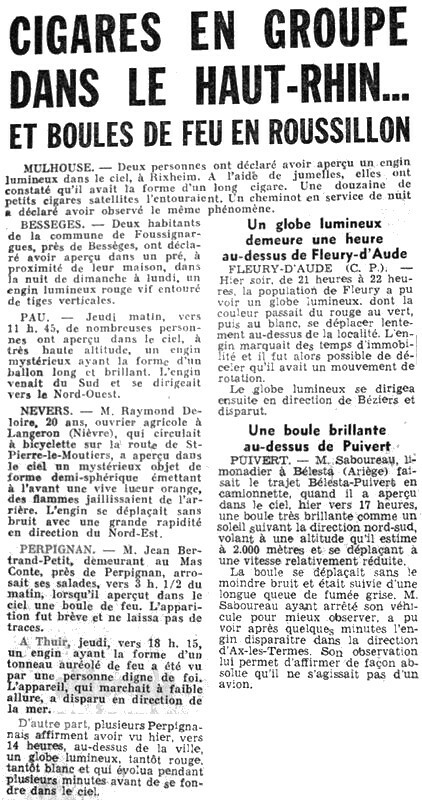 [in1] Article in the regional newspaper L'Indépendant, Perpignan, France, October 2, 1954. 1.0 Patrick Gross October 24, 2011 First published, [in1].